Ceph is an open source storage platform, it offers high performance, reliability, and scalability. It's a free distributed storage system that provides an interface to object, block, and file-level storage without a single point of failure. This is the third part of the Ceph tutorial series. In the first part, I've shown you how to build a 'Ceph Cluster' with multiple nodes on CentOS7. The second part is a guide that shows how to use Ceph as a Block Device on the CentOS 7. In this third part, I will show you how to mount Ceph as a File System on CentOS 7 as Client. Ceph Cluster - 1 Ceph-admin node, 1 Moinitor node (ceph-mon), 3 Ceph-osd nodes (see part 1). Client2 - CentOS 7 server (see part 2). We logged into the server with root access, now we can create the new cephuser. After the new user has been created, enable sudo password-less for the user by creating a new configuration file in the sudoers directory. Next, install NTP, ntpdate command line tool and open-vm tools. Then update and synchronize the system time with ntpdate. Disable SELinux and edit the host's file. Save the hosts file and exit the editor. Now try to ping the ceph-admin node to test the connection and hostname setup. You should see the ceph-admin node IP address as the result. The ceph-common package can be installed from the Ceph repository. It contains the Ceph utilities to mount and interact with the Ceph Storage Cluster. Before we can proceed with the installation of the ceph-common package, we have to add the epel-repository and the Ceph repository. Update the system and install the Ceph common utilities. Next, we have to add the configuration on the ceph-admin node. In this step, we will configure the cluster so that we can connect from admin to the client2 node with ssh key (without the password). Connect to the ceph-admin node as root and then login to the cephuser with su. 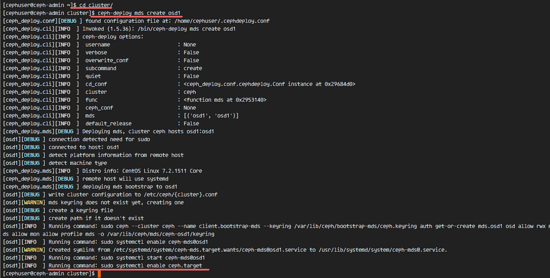 Edit the ssh config file and define a new client2 config section. 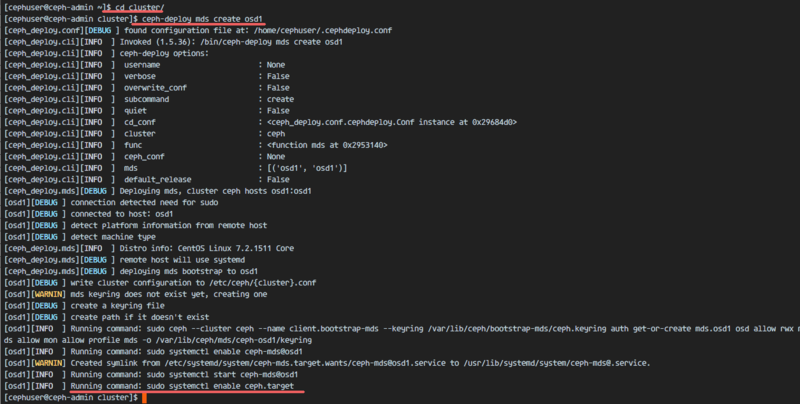 Next, add the host configuration line for the client node to the '/etc/hosts' file on the ceph-admin node. Paste the host configuration below at the end of the file. Save the hosts file and exit the editor. Now add the ssh key of the ceph-admin node to the client2 node. The ceph-admin key has been added. Now we can access the client2 node without the password from the ceph-admin node. If you want to run and mount CephFS, you need a ceph metadata server (Ceph MDS). Ceph MDS is running on the OSD nodes. We can install Ceph MDS to the OSD node with the ceph-deploy command from the ceph-admin node. Login to the ceph-admin node and become the cephuser. Go to the cluster directory and run the ceph-deploy command for creating a new ceph metadata-server (Ceph MDS). I will use the 'osd1' node as the metadata server. After creating the MDS server on osd1 node, we have to connect to the node with ssh. Next, create new pools for the MDS server, at least we need 2 pools - cephfs_data and cephfs_metadata. Create new pools on the 'osd1' node. The new pools are ready. Now we can create the new filesystem by using the named pools: cephfs_data and cephfs_metadata. cephfs = File System name. When you finished this step without an error, then check the MDS server with the command below. Now you can see that the filesystem name is 'cephfs', the metadata pool is 'cephfs_metadata', and the data pool is 'cephfs_data'. Make sure the MDS is up and active before you proceed. The Ceph MDS server has been created on the 'osd1' node. Now we are able to use CephFS. In this step, we will mount CephFS on the client2 node as the file system with the mount command. Before we start with the next step, we need to install ceph-fuse from the ceph repository on the client2 node. When the installation is done, copy the key of the user. In our default configuration, the cephx authentication is enabled. The default user is 'admin'. Copy the key from the MDS server node 'osd1' to the client2 node with the scp command, then change the permission of the key. Next, create a new cephfs directory and mount the CephFS to that directory. You will see a new filesystem of type 'ceph' mounted in the list. To unmount the filesystem, use the umount command utility. After we've successfully mounted CephFS as the filesystem, we will mount CephFS as Fuse (Filesystem in USErspace). For this setup, we need to copy the configuration file 'ceph.conf' and the key from the monitoring node 'mon1'. Create a new ceph directory on the client2 node and copy the configuration file and key. Change the permissions of the files. Next, create a new fuse directory and mount CephFS as Fuse to '/mnt/fuse' directory. Make sure there is no error, and check that the CephFS is mounted. To umount the CephFS Fuse, use the kill command. In this step, we will permanently mount CephFS with fstab. We will edit /etc/fstab and add the configuration for mounting CephFS with the kernel driver, using the mount command. Mount all disks from the fstab with the mount -a command, then list all available disks. Finally, reboot the system and check the available disks to ensure that the configuration is reboot-safe. You will see that CephFS has been mounted automatically with fstab.